If you didn't think that Carrie Underwood was a powerhouse, you will after you see her in concert. The pregnant mama of one will be headed to tour in the new year. 2019 is going to be big for Carrie, first she is going to have her second baby at the beginning of the year, and then just a few short months later, in May, she plans on headlining the Cry Pretty Tour 360. Not only is she headed out to sing after giving birth, she is going to have 55 tour dates from May until the end of October in 2019. The first show is set to kick off on May first in Greensboro, NC at the Greensboro Coliseum Complex, then Carrie will head to nearly every state in the United States, plus some Canadian stops, all the way until October 31, where she will end the concert tour in Detroit, MI at the Little Caesars Arena. This will be the first tour that Carrie has done since 2016, she had taken a break from music while recovering from a fall that damaged her wrist and face. Now, she is back in good health and ready to rock the arena! There are some really cool features to the Cry Pretty Tour, first and foremost, the show is going to be done in 360 degrees, which means that guests will get a view all the way around, so it's near impossible to miss the action happening on stage. 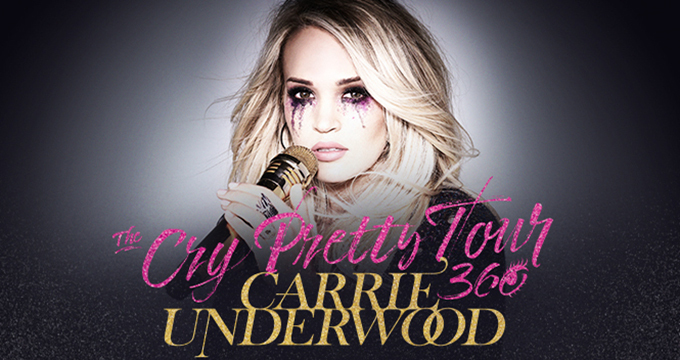 Another awesome feature to this concert tour, is that every ticket purchased comes with a code to download Carrie's new album, Cry Pretty. So, basically, fans are getting a two for one deal, which is perfect! Now you can listen to Carrie on the way to the concert, and if you didn't get your fill seeing her live, you can listen to her on the way back home. Alongside Carrie on tour dates, are two opening acts that have been taking the country music charts by storm. First is the duo Maddie and Tae, who sing original songs like "Girl in a Country Song", "Die From a Broken Heart" and "Friends Don't", as well as covers of the infamous "Jolene". These girls may be young, but they are concert tour veterans, they've been on tour with Brad Paisley, Lee Brice, and now Carrie Underwood. Then there is Runaway June, the all-girl country trio that is reminiscent of the Dixie Chicks, songs like "Lipstick", "Buy My Own Drinks", and "Wild West", have a saucy feminist vibe, sure to wow the crowds at the Cry Pretty concerts! There is no doubt that this is a must-see show, the former American Idol contestant is no newbie to the stage and has endeared fans for years with her hits. From sweet love songs, to raspy bar hits, this girl knows how to entertain a crowd. If you haven't bought your tickets yet, what are you waiting for? All Carrie Underwood tour dates are sure to sell out in no time.